Romulo Avelica-Gonzalez and his wife had just dropped off their youngest daughter at school in the Highland park neighborhood of Los Angeles. They were en route to drop off another of their four daughters when Romulo saw flashing lights from a black car that had been following them. Government officials with only the word “police” emblazoned in large yellow letters on their backs emerged from the unmarked car, demanding that Romulo get out immediately. Despite not identifying as such, the men were Immigrations and Customs Enforcement (ICE). They arrested Romulo while his wife and 13-year old daughter, Fatima, watched in tears from the car. Amidst her sobs, Fatima pulled out her cell phone and pressed record. ICE agents said they arrested Romulo, who has lived in the U.S. for over 25 years, based on two decade-old misdemeanor convictions that have since been vacated, and an order for removal from 2008 as a result of the misdemeanor convictions. His lawyers were able to temporarily combat the order with an emergency stay. Romulo’s case represents how families are being torn apart by new policies targeting undocumented immigrants. Under Trump’s new widened deportation machine, every one of the estimated 11 million undocumented immigrants in the U.S. is a priority, misdemeanor conviction or not, even while driving their daughters to school. With help from a journalist, Romulo’s family publicly released Fatima’s footage of her father’s arrest. The video went viral, garnering national support for Romulo’s case as his story became emblematic of the effects of the new administration’s racist and inhumane immigration policies. Fatima’s video helps expose how ICE agents often portray themselves as officers from local police departments to ensnare or fool people into revealing information, or even into giving ICE consent to enter their homes. Advocates say the use of tactics like these are especially egregious in heavily immigrant cities like Los Angeles where police and elected officials have tried for decades to distinguish local cops from federal immigration agents. In just the first six months of 2017, reports of domestic violence have declined among immigrant communities in some of California’s largest cities as undocumented immigrants avoid courts and local police in fear of deportation. The video also ignited debate around whether ICE violated their own policies by arresting Romulo just five blocks from his daughter’s school. By ICE’s own directive, school’s are considered sensitive locations which should “generally be avoided, and require either prior approval from an appropriate supervisory official or exigent circumstances necessitating immediate action.” Neither approval nor exigent circumstances were present in Romulo’s case. While the video did help to expose abuse and usher in support for Romulo and his family, the high profile case also added to an escalating climate of fear among immigrants in the U.S. The media attention also thrust Romulo’s family – including his young daughters – into the spotlight. Working with NDLON, a trusted advocacy organization, helped the family negotiate interview requests before they became overwhelming or potentially retraumatizing. While the spotlight can serve as an important platform, providing more intentional training to immigrant families can help them to be better prepared. Video can be a powerful tool for justice, but it’s not always safe to share videos of ICE and people being detained on social media. Sharing footage online could potentially put ICE’s target and their families at further risk, or expose other undocumented bystanders in the frame – making them vulnerable to retaliation. In another case in Los Angeles, 22-year-old immigration activist and college student, Claudia Rueda, was arrested by Customs and Border Patrol while moving her family’s car. Claudia, who is undocumented and came to the U.S. when she was 4-years old, was allegedly detained as part of a probe into a “cross-border narcotics smuggling operation,” and later arrested by ICE. Community members and friends of Claudia, however, believe she was targeted because of her visibility in the media and on social media from protests she led, advocating for her mother. Claudia’s mother was detained as part of a multi-agency drug raid at her home that resulted in the arrest of her husband. 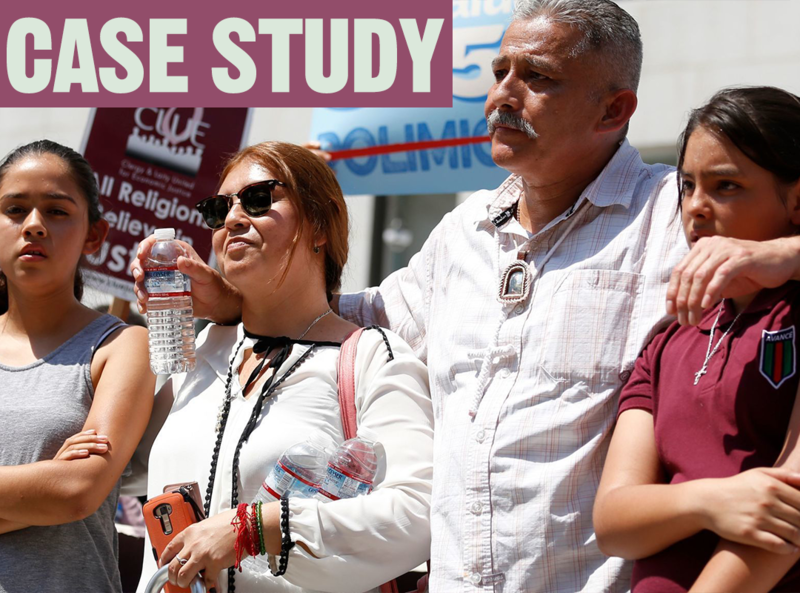 Despite being told she would not be detained if she cooperated, Claudia’s mother was still arrested by Customs and Border Patrol agents for her immigration status. Claudia led a series of protests calling attention to her mother’s unjust detention and collusion between local law enforcement and ICE. Though Claudia and her mom have since been released, she still faces possible deportation, and has been working to apply for DACA. For those who have filmed or received a video of an ICE related incident, before making the decision to publicly release footage, pause and consider the potential benefits and risks to sharing the video. Are there any identities that you need to protect? Do you want your name associated with the footage? Are you prepared for the potential media attention? When will you release the video? How will you use video create the biggest impact? Those are the types of questions David and his colleagues are asking themselves as they continue to use video as a tool for their immigration work. While Romulo’s case developed at lightning speed and both his family and NDLON had to roll with the punches, they are now working to incorporate best practices and lessons learned from the case into video advocacy efforts moving forward – especially around timing (when to share a video and with whom) and impact (tying videos to specific policy demands). “I think it’s always important to have testimony to the things that are happening and to be a witness to the things that are happening to people every day,” David said. “So even if it’s not tied into a very sophisticated campaign i think that it’s still important to have as a piece of testimony. Regardless of whether or not a video is linked to a larger campaign, it can still serve as valuable documentation of the pain and challenges a community is facing. After six months of Romulo’s family, community, and lawyers tirelessly advocating, organizing, rallying and speaking to media, Romulo was finally released from immigration detention. Although he’s been released and is now at home with his family, Romulo’s story is nowhere near finished, and there is so much more work to be done before he is guaranteed a stay with his family in the U.S. So while it’s necessary to remain hopeful and celebrate victories along the way, it’s important to remember that the struggle continues.